So, one of my goals for 2018 was to make jackets and coats: I had declared it “The Year of the Coat”. I managed to make one. 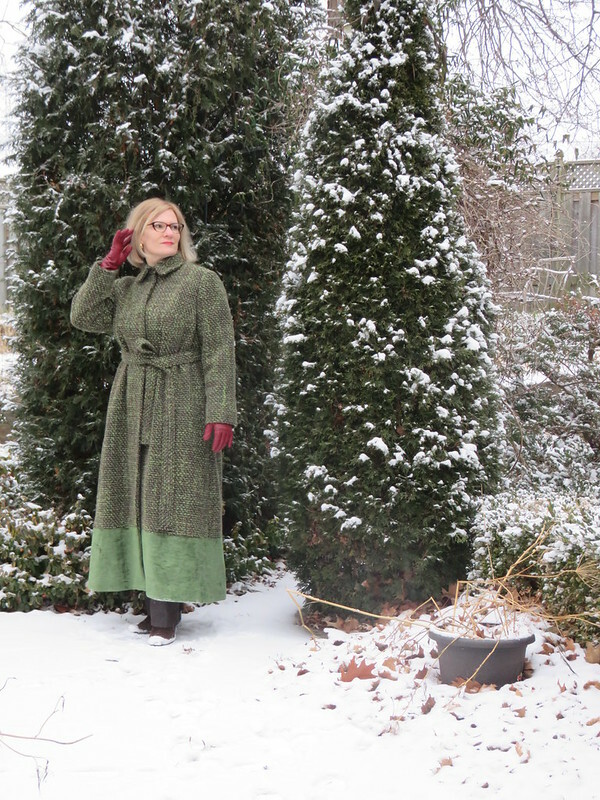 I did not like the tie collar (and the linen would not have worked for it, imho), so I frankenpatterned Vogue 2590 (an OOP Montana military-style coat). I love the high collar, and I must say, working with a Vogue pattern vs. a Burda magazine pattern in the same project was a sober reminder (and an elated reminder) of why I love Vogue patterns so much: there were more markings on the collar pieces than the entire front coat pattern piece from Burda. A clearly marked pattern makes construction so precise, and easy construct with (relative) perfection. Well, I am happy with it, anyways! The coat does not have buttons. I debated doing the hand worked buttonhole exercise, but opted for the large snaps Burda suggested. I like them! 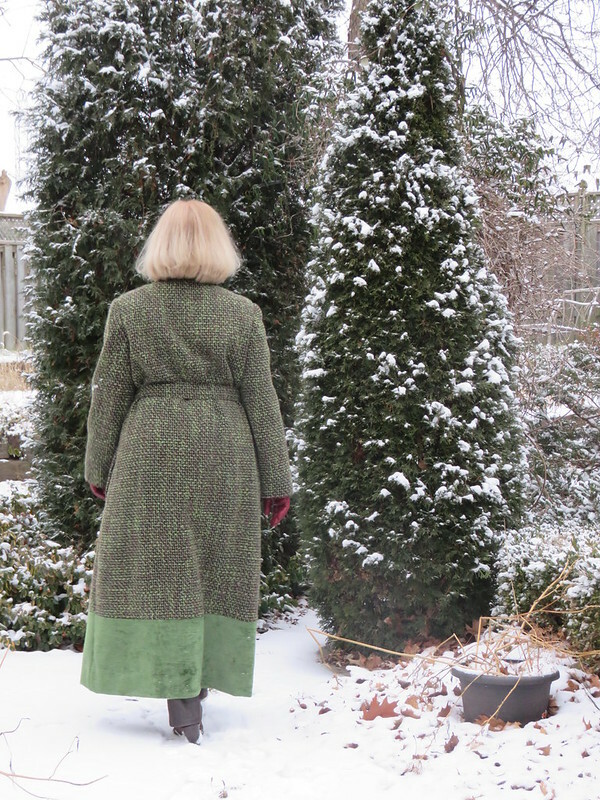 And, no, I did not bother to try to choose a fabric that would match the coat so they could be covered. I just put them on. Finis! A tall, statuesque drink of water I am not, which is perhaps accentuated by the tie belt. But I love the length and drama of wearing such a coat. Beautiful, warm and cozy! There’s nothing better than a long warm coat in the snow. Fabulous coat, I agree the collar on the original would probably be a bit annoying and you’d have to wear it closed the whole time. Love the extra long length and the combination of fabrics, I do love a bit of drama in clothing too even if that isn’t necessarily reflected in my everyday wardrobe! Obviously your left those fabrics in your “aging closet” long enough to be brought out and made into something wonderful! Wearing it must make you feel so special and cozy! Great photos and the change of the collar…so much more wearable and flattering! Amazing. And a perfect pairing of fabrics – that’s a really good idea and adds drama to your coat. One coat is better than no coats 🙂 And what a lovely coat it is. Very dramatic. This is absolutely gorgeous, and you look fabulous in it! I hope you feel as wonderful wearing it as you look in it! Not only that, this coat looks like it is so warm. Just perfect! Thank you! It is a warm coat, and it is fun to wear. Lovely! I think the contrast band looks great. The proportion is spot on. It’s stunning! I love that wool! 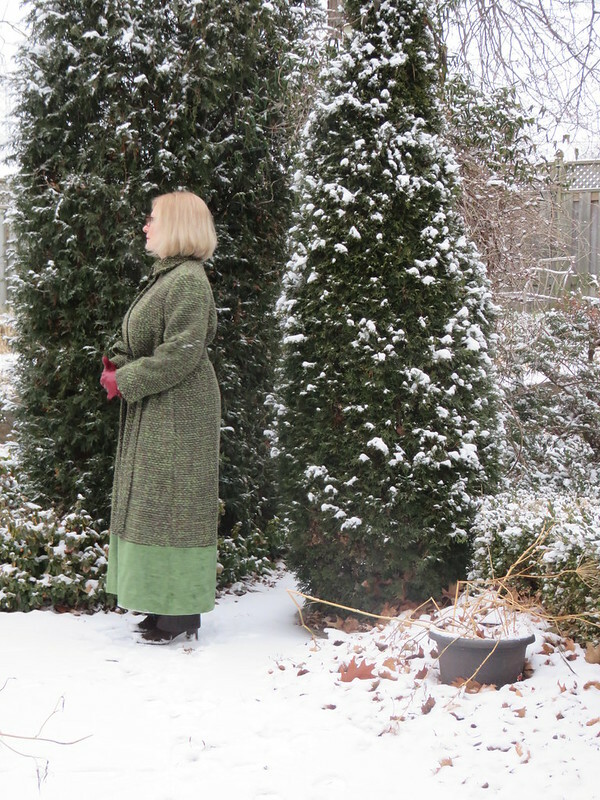 I need to make a coat, but every year I put it off and then it’s too warm again for a coat (winter tends to be short, and come and go here). What a lovely the coat. The band of velvet linen is an extra piece of drama. Thank you! I love the linen and was so happy it coordinated to well with the wool. This coat is so gorgeous and you look gorgeous wearing it! That is just outstanding, and you will love it for years! I prefer your collar choice, and it is perfect for those cold windy days. The fit in the shoulders is spot on. Linen velvet sounds sooo luxurious, and that texture on that wool is perfect for a coat. I bet you love wearing this! 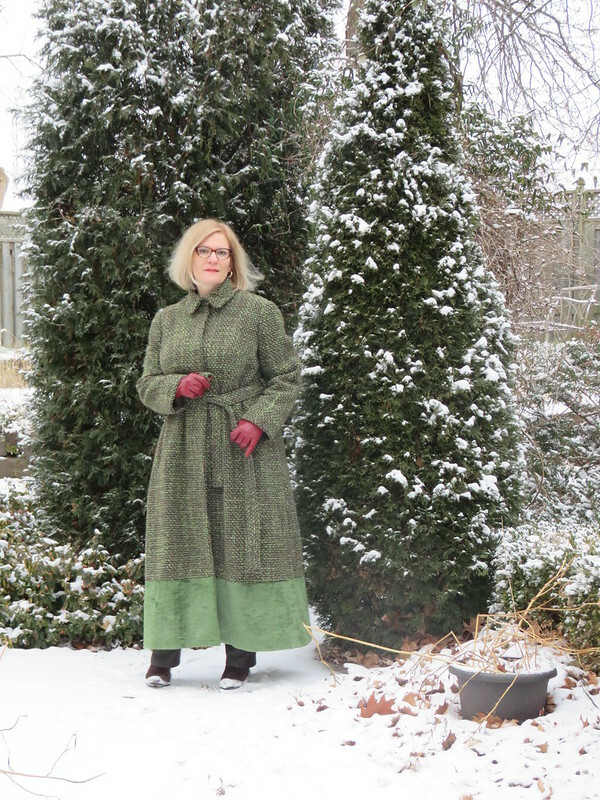 It is rather fun swishing about in a long coat! 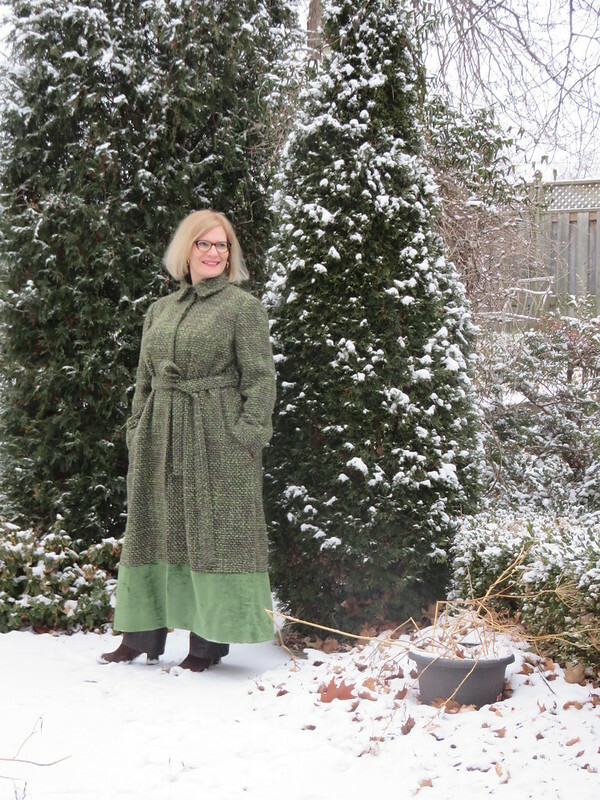 Grear coat -I love the shades of green together and the added collar is much nicer than original. I thought 2018 would be my coat year too, but it never happened! I am being kind to myself: I got one made! So I’ll set the goal for another one this year. I’m cheering you on for your 2019 coat! Beautiful coat, enjoy wearing it. Longer coats also keep legs warm in a cold wind! Gorgeous coat, which to my eye seems a classic design that should serve you well for many years. Very flattering! Beautifully done and looks great on you. Love the collar you changed out, too. Enjoy and Happy New Year! Wow. Totally gorgeous and so are you!! Loved your dress in the last post, too. You always knock it out of the park. Thank you, Stephanie! You are too kind! I love drama in my clothing, although my day-to-day wardrobe is not so outstanding!